Blocking the activation of T cells in response to proinsulin could help quell the autoimmune attack in the pancreas. 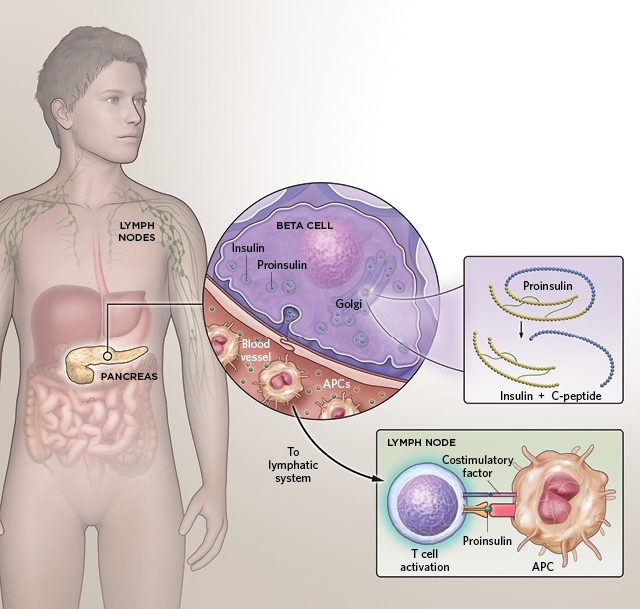 In patients with type 1 diabetes, the immune system generates antibodies and activates cytotoxic “killer” T cells to attack molecules that are produced by the beta cells of the pancreas. 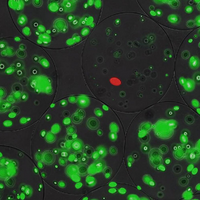 Researchers are now developing therapies that quell these specific immune pathways to tolerize patients to their own autoantigens while leaving the rest of the immune system intact. © SCOTT LEIGHTON © SCOTT LEIGHTONOne so-called autoantigen that is attacked in type 1 diabetes is proinsulin, the precursor to insulin. 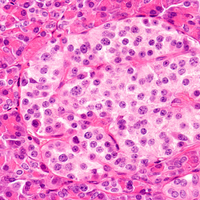 When proinsulin is released into the bloodstream, antigen-presenting cells (APCs) pick up the molecules and carry them to the lymphatic system, where, alongside costimulatory factors on the APC, they activate cytotoxic T cells that migrate back to pancreatic islets and damage the beta cells. One method that has enjoyed preliminary success in reversing the aberrant immune response in type 1 diabetes is the presentation of the proinsulin autoantigen without the costimulatory factors needed to activate cytotoxic T cells. 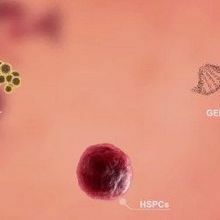 Patients treated with a plasmid that is engineered to be non-immunostimulatory and to express the gene for proinsulin experienced an increase in the production of C-peptide (a measure of beta cell function) and a corresponding decrease in cytotoxic T cells that recognized proinsulin. 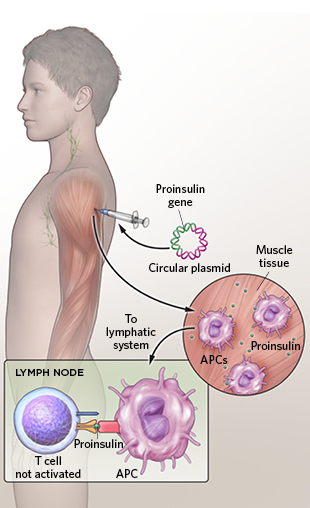 A plasmid encoding the gene for proinsulin is injected intramuscularly into patients, ramping up levels of proinsulin. Proinsulin is taken up by migrating APCs that do not present costimulatory factors on their surface. 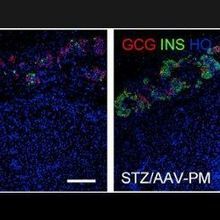 The APCs travel to nearby lymph nodes, where they interact with T cells, but without the costimulatory factors, cytotoxic T cells are not activated.